3D printing will soon be available to the masses and not just industry professionals, thanks to the innovative OLO printing device which uses smartphones to print objects in 3D. The device was designed by a team in the US and was officially released in October 2015 following its debut at the World Maker Faire in New York where it won the Editor’s Choice Award. The team at OLO 3D Inc which came up with the game-changing technology is currently raising funds for the device through crowdfunding platform Kickstarter, where it has raised USD $1.9 million so far. OLO is essentially a portable 3D printer that’s made of seven plastic parts, one chip and one motor. It utilises a new line of material called Daylight Resins which harden under the white light of a smartphone screen. Its case was designed specifically to filter out all harmful external light to maximise the precision of the print which can reach an impressive resolution of 42 microns. Weighing just over a pound, the OLO is portable and can fit easily into bags and backpacks. Despite its compact size, OLO can print objects with sizes up to 400 cubic centimetres and can fit almost any smartphone on the market, including the larger iPhone 6S+ and Samsung Galaxy A7. It is powered by motors operating on AA Batteries which will last at least 100 prints, allowing users to print anything anywhere. OLO 3D Inc says the printer has been designed to be used by everyone. All users need to do is select a model, pour in the resin and the OLO printer will do the rest. 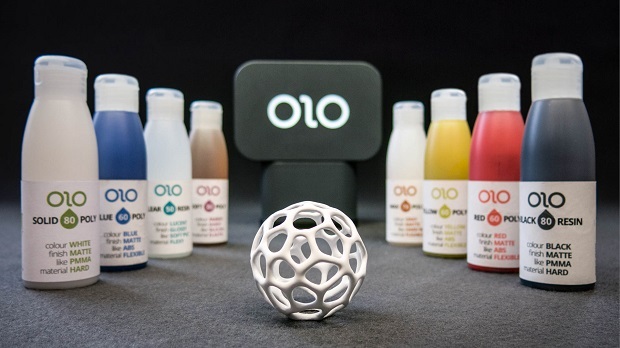 Despite that, OLO can also be used by industry professionals to print prototypes and end-use parts, due to its high accuracy and the wide variety of materials available which includes hard, flexible, translucent, coloured and castable resins. Users can print objects in a variety of colours and build with the OLO printer. OLO’s app works on iOS, Android and Windows devices and is compatible with a variety of free 3D software. Users can use 3D scanning apps such as the Autodesk 123D Catch or any modelling software to design their own custom parts. An interesting feature is the OLO 3D Message function which allows creations to be shared between friends and family using the app. Users can also choose to send messages in "surprise mode" where the contents will only be revealed when printed. OLO 3D Inc is looking to price the printer at $99. In an interview with 3D printing information website ALL3DP, OLO co-founder Filippo Moroni says the plan in the next six months is to release a higher resolution OLO. "At the moment we can reach 52 microns which is very good, but we will also develop OLO Pro, which will be based on a tablet," he says. As phone sizes change in the future, Moroni says OLO 3D Inc will adapt by releasing a "Pro Pack" which can fit bigger screens up to 12 inches. With the Pro Pack, users can still print from a small screen. He says the company is delighted to have received such amazing response worldwide. "It proves that what we invented is on the right path and we are really happy to share this with the world." Moroni adds OLO turned down offers to partner up with commercial companies to produce the printer and resorted to Kickstarter instead to keep prices down. "We had big offers from big international players which we refused so we can control the price. We want something small, easy, and for everyone."